As the days gradually shorten and the temperature drops, there’s nothing quite like a bracing afternoon walk followed by a comforting mug of hot chocolate. Most hot chocolate is good in my book, but for the ultimate Theobroma experience, it’s worth taking that extra few minutes to make yourself some real hot chocolate. Hot chocolate is an indulgence I allow myself from time to time. I figure not only does it have a high feel good factor, but it’s an awful lot better for me than dashing to the shops for a cheap chocolate bar fix. This has also been known to happen, unfortunately. When I make hot chocolate, I like to use real chocolate rather than cocoa or chocolate powder. It feels more luxurious and you can use the brand, type or cacao percentage to suit your mood or palate. The quality and type of chocolate will make quite a difference. I remember comparing and contrasting three different drinking chocolates once, each made from a different single origin chocolate bar. The 70% from Brazil was rich and very chocolatey; the 61% from Madagascar had the familiar buttermilk tang that I appreciate so much and the 75% from Peru had notes of tobacco and coffee. You can read a bit more about it in one of my Chocolate Bites posts. If you’re a frequent hot chocolate drinker, why not stir things up a bit and try different flavours in your drink? Spices are a classic addition and go particularly well. The ancient Mayan xocolatl included vanilla and chilli. This combination is a particular favourite of mine. Cinnamon, nutmeg or cardamom can also be used and a pinch of sea salt is regarded as mandatory by some gurus. There’s just so much fun to be had. Go mad with alcohol. Rum, brandy and amaretto are all good, but my personal favourite is to whisk in a wee dram of whisky right at the very end. For something a bit more substantial, this honeyed rose hot chocolate makes a fabulous treat. White chocolate can also be used. It’s generally way too sweet for me, but I’ve found it works exceedingly well with matcha (Japanese powdered green tea) as in this matcha hot chocolate. I much prefer a drink where I can taste the chocolate and I’m not overwhelmed by sugar. For me, the sugar already present in dark chocolate is usually enough. However, if you want to use a really dark chocolate or even a 100% variety, you’ll probably want to add some sort of sweetener. Sugar is fine, but honey or maple syrup work well too and give a distinctive flavour. If you like your hot chocolate sweeter than me, just add sugar to taste. You could even add a little milk chocolate to the mix instead of going all out dark. 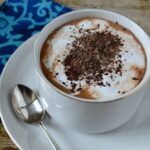 It’s easy to make a dairy free or vegan hot chocolate. Just use your favourite vegan milk along with vegan friendly chocolate. I’ve found almond or coconut milk work best, although hemp milk is also good. 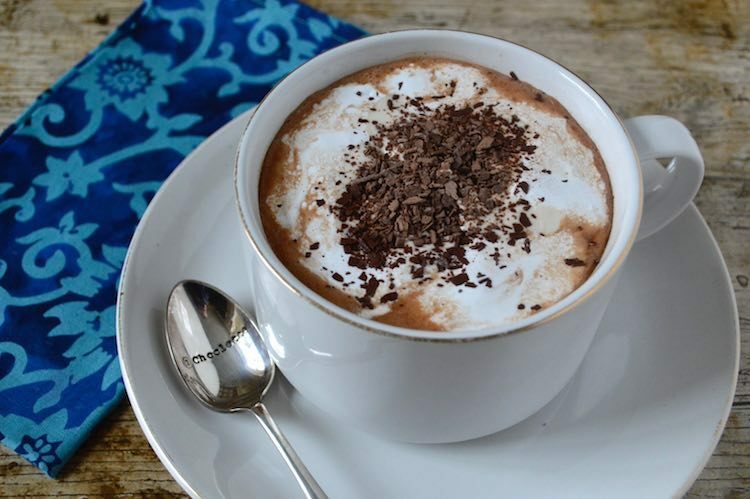 This rich and velvety vegan hot chocolate is particularly delicious. I make it with 85% dark chocolate, cocoa powder, coconut milk and a little maple syrup. If you have a particularly good quality chocolate, try it mixed with hot water only. The various notes and tones really come through and it makes for a much richer drink. For a truly indulgent drink, pour your hot chocolate into a mug, scatter some marshmallows over the surface and top with whipped cream. The marshmallows are like a raft, holding up the cream and stopping it from sinking and melting. Don’t forget to scatter a bit more chocolate over the cream before sticking your spoon in. In this instance I forwent the cream and marshmallows, but used marshmallow fluff instead. I have been known to add both marshmallow fluff and whipped cream, but enough said about that. Marshmallow fluff is very sweet, but it adds an extra dimension and makes it feel as though the hot chocolate is more of a dessert than a drink. It’s also vegetarian. It’s best to chop your chocolate quite finely or grate it so it can melt quickly and your drink won’t be cold from whisking before it gets to the cup. You can also buy pre-chopped chocolate especially for this purpose. I’ve reviewed several brands over the years and some are much better than others. Hot chocolate drink made with real chocolate and topped with marshmallow fluff. Heat the milk to near boiling point. Take off the heat and whisk in the chocolate until melted and smooth. Pour into two mugs or large cups, then top with the marshmallow fluff and a good sprinkling of chocolate. Half, double or triple the quantity depending on how many people you're serving or how big your mugs are. Top with whipped cream instead of, or as well as, the marshmallow fluff. This real hot chocolate is my contribution to October’s #WeShouldCocoa. I’m also sharing this with #CookBlogShare over at Recipes Made Easy. I too love to use real chocolate to make hot chocolate drink! So much easier and tastier! Actually it’s the only hot chocolate I make, although I do also make cocoa with hot water, no sweetener and just a dash of milk. But that’s a completely different type of drink. Yummy! I have never tried making hot chocolate from a choc bar before, but it just so happens I have a 70% dark chocolate bar in the cupboard, plus some seeds waiting to be made into hemp milk. Guess what my post work snack will be today?! Cool. Did you make the hemp milk and indulge in a hot chocolate? Just seen your reply, sorry for late response…. I never got my hot chocolate that night, as I went out running, tripped on some leaves and split my lip, so the rest of the evening was spent in my local Aand E! I looked like a Hallowe’en mask! But I have indulged since, with a mix of hemp and soya milk, raw. Sugar, 70% dark chocolate and just a touch of molasses….. awesome! Oh no. How awful. I hope you’ve made a full recovery now. I reckon you need plenty more hot chocolates to make up for it. Think I might need one now – it’s so cold I’m typing this with my coat and scarf on. Only real chocolate not cocoa powder can have that real chocolate taste. Love it.